4.0 out of 5 based on 57 bloggers and 7 commenters. 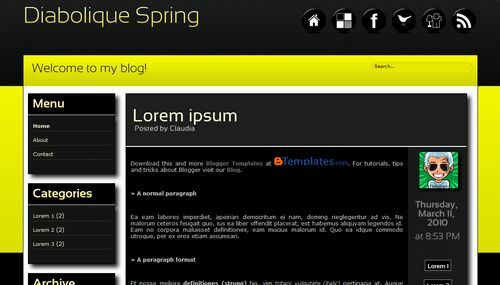 Diabolique Spring is a free blogger template with 2 columns and left sidebar. Within last 2 weeks I have submitted 3 templates. Why they weren’t reviewed yet? If you don’t have much spare time just give me your donation link or set a flat rate for speedy submission. @Diabolique: Your templates were not published because you sent templates with the Blogger navbar included (if we remove it, they will look messy and we’ll need to make some margin adjustments) and your designs are too wide (for example, Diabolique Pearl was created for 1280+ px width screens). We have a lot of templates to publish but, if you send quality templates, you must be sure they will be published. I resubmitted Diabolique Pearl with 1170px width and Diabolique Spring Silver. Are there any plans to publish it? How much they pay for designers for every new submission? I love this template, is there a way to revise the image that’s applied to the posts? Thank you!